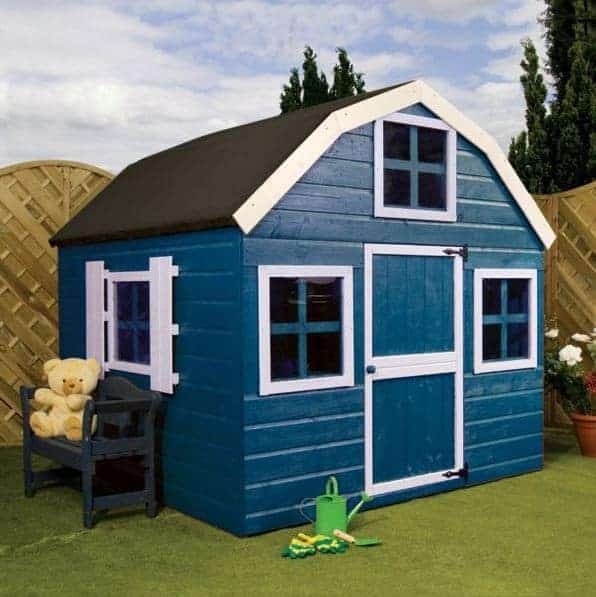 This larger than average playhouse is designed in a Dutch barn style that looks very elegant in its bare wood form, and will look hugely fun and inviting to your children or grandchildren when it’s been painted in bright, vivid colours. The extra space that it provides will allow your loved ones to really indulge their creativity and imaginations, and they’re sure to enjoy this corner of the garden that will be exclusively theirs. One of the things that really impressed us was just how bright and welcoming the interior was, and that’s thanks to the inclusion of five fixed windows. They’re made out of styrene as well, so safety is taken care of. 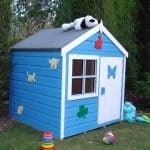 In fact, the playhouse as a whole meets BS EN71 child safety standards, which is very reassuring. Once inside, the children will be kept dry at all times as the building has excellent weather defences, beginning with the tall barn style roof that simply carries rainwater away. The walls are also designed to keep rain out, as they’re made of tightly interlocking tongue and groove cladding. 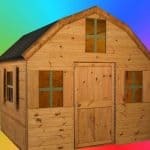 It’s a high quality material that also ensures that the playhouse is strong and stable enough to withstand windy conditions. 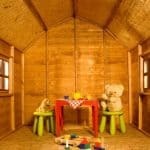 Dutch barns are timelessly stylish, so we really liked this playhouse that replicated that classic look whilst shrinking it down into a child-friendly play area. 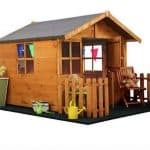 This is one playhouse that you’ll be proud to have in your garden, and its attractive appearance is sure to stir the imagination of the youngsters who’ll be using it as well. There’s more than enough room to install some children’s furniture, as well as a good selection of toys and games, and with lots of headroom as well it’s even suitable for slightly older children. 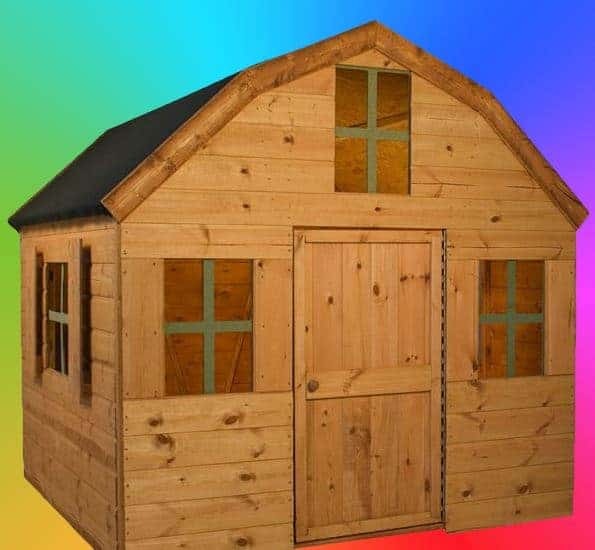 The roof is one of the first things that struck us, and it creates the barn styling that’s so pleasing on the eye. 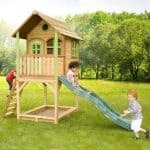 Made of OSB covered in roofing felt it’s very good at keeping rainwater out, but it also makes this one of the tallest playhouses we’ve reviewed. The ridge height is 1.88m and the eaves height is 1.20m, and the width and depth are also slightly above average, being 1.83m each including the overhang. 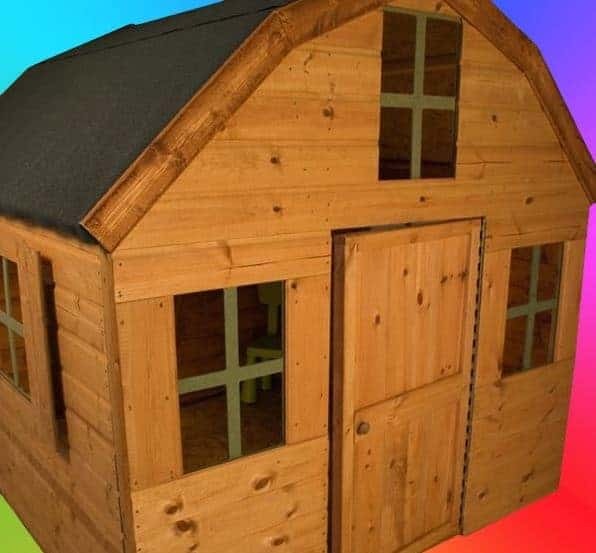 The exterior styling of this playhouse may be unique, but we were glad to see that it still featured the tongue and groove cladding that we always like to see. It’s thickness of 12mm gives a sturdy feel once assembled, and because it fits together so well there’s nowhere for water to seep into. The floor is made of solid sheet material. 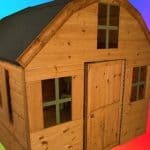 This is a cheaper option than tongue and groove, but it’s one that we’re used to seeing on playhouses. It’s thickness of 8mm is a little less than some that we see as well, but we were pleased to see that it featured integrated floor joists. These raise the floor above ground level, and therefore reduce the chance of rot taking a hold by keeping it away from the high moisture content often found on the surface. 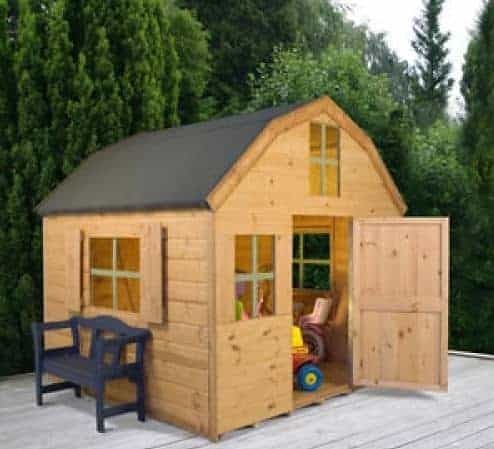 With a playhouse of this price, we would have liked to see the extra reassurance that an extended warranty gives to the customer, but on this occasion a mere one year warranty against rot is provided. One possible reason for this is that the timbers have only had a dipped basecoat of wood preserver, which means that they don’t have a long lasting protection. You’ll want to boost this protection level, of course, so that means that the customer will have to add their own coats of wood preserver on at least a yearly basis. 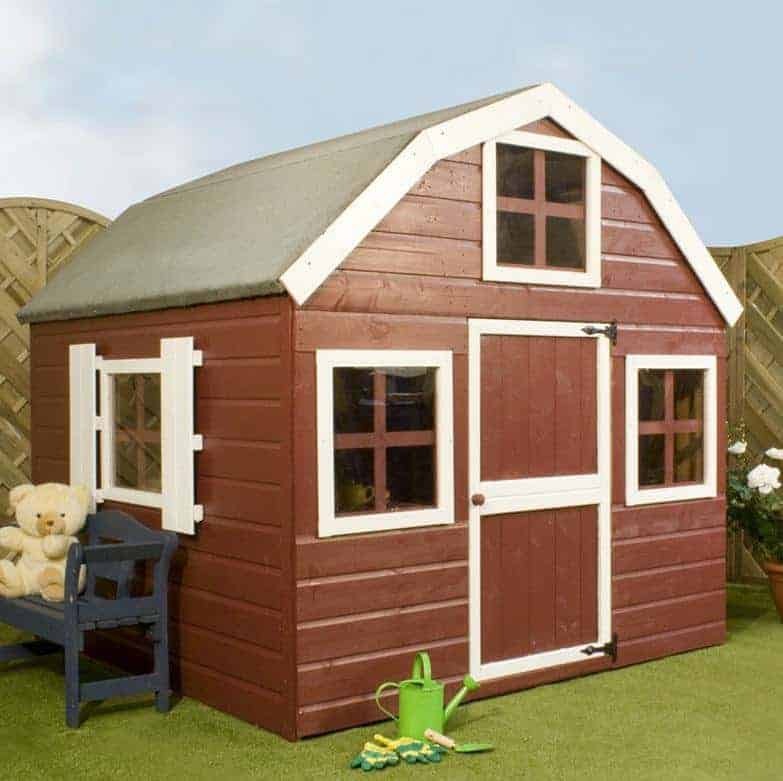 There were two things that we liked about the single hinged door on this playhouse, and one is that it’s slightly more accommodating than some that we see, having a width of 0.62m and a height of 1.08m. It also has a 12mm non-trap gap which means that you won’t have to worry about little fingers getting caught in it. The features that impressed us most of all were the five fixed position windows. That’s the largest amount of windows we’ve seen on a playhouse of this size, and being placed on different levels they look fun and ensure that the interior is very well illuminated on a sunny day. 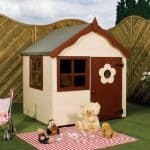 This is perfect for children who love to read or draw, or play board games, inside their playhouse. The other thing we liked about the windows is that they feature styrene glazing. This is a safe, non-shatter plastic that acts like glass but is much tougher. 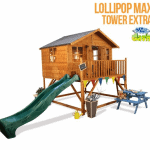 In conjunction with the non-trap doors this creates a very safe environment for children to play in, and that’s why it comes with the reassurance of meeting the European standard for toy safety. 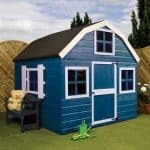 We were pleased to find that several optional extras were available to buy with this playhouse, including a fun boules game that all the family can join in with. There are also tubs of DIY treatment available in different wood shades, and whilst this may give the protection the wood needs we’re sure that children would appreciate brighter and more vibrant colours. Customers can also take advantage of a professional installation service, but as this costs over two hundred pounds we feel that it makes more sense to find a friend who can help you with self-assembly. This looked like a high quality building from the moment we saw it, and we were pleased to find it lived up to those expectations. The pressure treated floor joists help to protect the playhouse against rot, even though the floor itself could have been thicker, but we would have liked to see a long lasting preservative treatment used elsewhere as well. This is a larger than average play house, and thanks to the tall barn roof there’s lots of headroom inside as well. Despite the available installation service, we feel that self assembly is quite easy for two people as long as the instructions are followed carefully. Allow around five hours to complete the process. 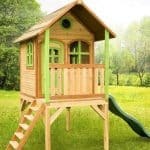 This playhouse costs nearly twice as much as some other similarly sized models, yet it still represents reasonable value for money given its quality and smart appearance. Final Thoughts: We like playhouses that have a look all of their own, especially when they’re as visually striking as this one. 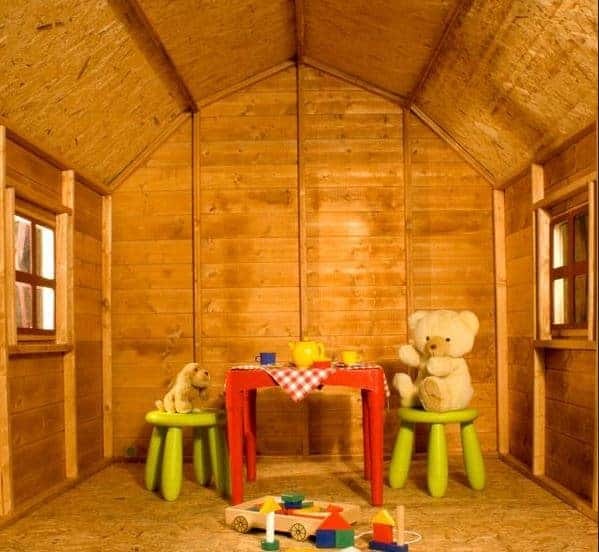 When painted in your child or grandchild’s favourite colours it’s sure to bring a smile to their face, and there’s lots of space inside for them to enjoy whether they’re playing with a toy or simply utilising their imagination. This is also one of the brightest playhouses that we’ve seen, thanks to its five fixed windows. It would have been nice if one or two of them could have opened for ventilation purposes, but we were pleased to see that they featured tough and shatter resistant styrene glazing.